One of the character traits that I really value in humans (both young and old) is generosity. I feel that in a world where so many people seem to be self-centered, coming across those who give without expecting anything in return is refreshing. 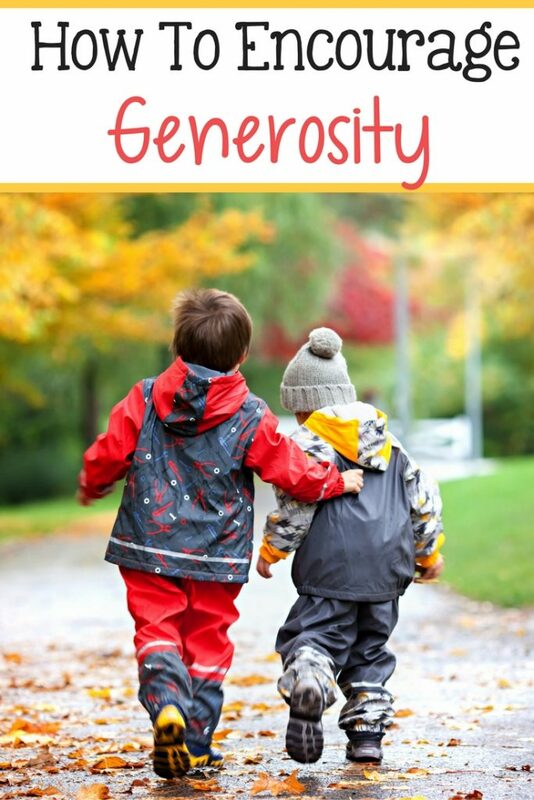 While generosity may seem to be a rarity, I actually come across it quite often and am determined to not only be generous myself but to raise my child to be generous as well. Here are some ways that I believe parents can encourage their children to be generous members of society. This may seem obvious, but it needs to be said. Much of what our children learn and many of the traits that they develop (both positive and negative) are learned at home. Our children, especially in the early years, spend most of their time with us. They watch, absorb, and model what we do – even if we don’t realize it. So, if you want your children to be generous when they get out into the world, one big way to ensure that is to be generous yourself. Whenever you have the opportunity to give to others (whether you are giving away your time, energy, money, or valuables), do it. And do it with a smile. Seeing you giving to others and being happy about it leave an impression with your kids (and other witnesses) that just may compel them to follow suit. Another straightforward way to encourage generosity in your children is to talk about it. Tell them stories of when someone was generous towards you and how it not only made you feel but how it impacted your life. Ask them to think of examples of when someone did something for or gave something to them that they needed. Ask them how it made them feel. You can also tell them about when you did something good for another person and how it made you feel like you were doing something meaningful and special. Sometimes talking about doing and feeling good makes people want to feel that way themselves. You see it all the time on social media. People will share a video or a story about some good deed that was done and in the comments, you often see people saying that it made them cry happy tears, that they now feel like going out and doing something similar, or they will be overcome with emotion as the video triggers memories of something similar happening to them and how now they want to pay it forward. Never underestimate the power of emotions. Often, the benefactors of our generosity are people who we feel are, in some way or another, less fortunate than ourselves. Take the opportunity to talk to your children about social inequality. About people who go to bed hungry, or don’t have homes to sleep, or are victims of war in their countries. Tell them, in a way that is age-appropriate but still impactful about the fact that there are people in the world who don’t have even the basic needs for survival. Often, hearing about the realities of people suffering when we have what we need can be sobering, enlightening, and prompt us to want to do something about it. Children are no different in that respect. If they know that there is something they could do to make life better or easier for others, they will probably want to do something. Brainstorm with your children about ways that you can give back to and help others. There are so many opportunities out there to practice generosity. There are also a ton of organizations and groups that you can collaborate with to do some charity work. Whether you work at a soup kitchen, make meals for the homeless, volunteer at a local shelter, visit the elderly in a retirement home, bring toys and books to an orphanage, or just volunteer to help people around the neighborhood, the opportunities are endless. Make it a family tradition to spend time each week or month doing at least one act of benevolence in your area. If you make it a habit now, it is likely that they will continue that habit as young adults and (should they decided to have children) as parents themselves. Last, but not least, when you notice your child being generous, acknowledge it. You don’t have to throw them a party or anything like that – just let them know that you noticed their good deed and that you appreciate that they are being an active part of making this world a better place to live in. The goal isn’t to stroke their ego. It’s simply to let them know that the good they do doesn’t go unnoticed and that it is meaningful, even if they don’t get a thank you or public recognition. These are just my thoughts on raising generous children. What are yours? Let me know in the comments below.